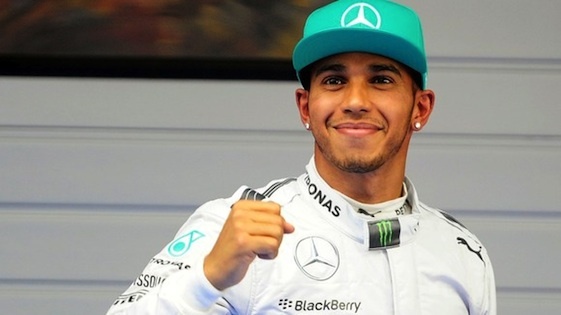 Lewis Hamilton topped qualifying in Australia on Saturday. Lewis Hamilton will launch defense of his Formula One World Driving Championship from P1 Sunday, as the Brit and Mercedes teammate Nico Rosberg swept the front row during knockout qualifying for the 2015 season-opening Australian Grand Prix. In a reprise of their dominant 2014 form, Hamilton covered the 3.3-mile/16-turn Albert Park Circuit in Melbourne in 1 minute, 26.327-seconds Saturday with Rosberg scrambling into second 0.594-seconds behind. Felipe Massa of Williams rounded out the podium, edging four-time world champion Sebastian Vettel of Germany in his debut for Scuderia Ferrari. “Well, it’s been a great start to the weekend,” said Hamilton, a two-time world champion. “It doesn’t feel like it’s been a long time since the last race. We’ve already had a big rush and a huge effort from all of the guys back at the factory to enable us to come here and have this performance, so I feel incredibly blessed to have this car. “And then we found a good balance; today was just about pushing those laps. It’s so much fun when you get into qualifying, you have those single laps which you have to push. So I’m just massively grateful for all the hard work that’s gone in.” Hamilton’s pole is his fourth in Melbourne, where he won the event en route to his first world championship with McLaren in 2008. Rosberg, runnerup to Hamilton in the 2014 point standings, overcame an engine cut-out issue during the second qualifying session and a lock-up in Turn 15 during Q3 to barge into the front row. “The story was that… well, first of all Lewis was in impressive form today _ he did an awesome job and nailed it all the time,” the German said. “And then, for me, the speed was there but I just didn’t get it together today. So it wasn’t a great day today. But of course I’m really thankful to the team for the car that they have given me _ it’s unbelievable. It’s a pleasure to drive and it’s a pleasure to be in this situation with this team. Massa, meanwhile, said he was confident his Williams is capable of challenging Mercedes and Ferrari. NBCSN’s live coverage will begin at midnight (EDT) with a half-hour Countdown preview program, followed by the race at 12:30 a.m.